Painted Daisy Quilt; Week 1 – Section I For those of you who are sewing along with me to make the Painted Daisy quilt, we are starting with the pieced block. Making all of these at one time will be the most efficient way to get them done in quick order. Only the pieces for the blocks will be cut at this time. When you are done with the blocks, press them and set them aside. This is so much easier and less confusing than cutting everything for the entire quilt and labeling all the pieces to be used later. This week you will be cutting, sewing and finishing the blocks to have ready for Week 2’s instructions. For those of you haven’t decided yet to sew along with all of us, I think you will want to print out the pattern as we go so you have it in your library. You might be sorry you didn’t get your fabric together to start today…but it’s not too late. Head to your stash or your quilt shop, get your fabric and join us. You will find the instructions written and illustrated in the customary Thimbleberries fashion…guiding you through each step and reminding you as you complete each step, what your unit should measure when completed. That has been the #1 most popular feature of Thimbleberries patterns. So take the opportunity to measure when prompted before you go on so you can correct at the beginning of the process. It makes everything so much easier down the road and prevents the need for the dreaded ripping tool. Also, remember careful pressing can make a huge difference in a block’s measurement and makes general quilt assembly so much more pleasant. Let’s get started….”see” you next Monday for Section II. Thank you so much for giving us such a beautiful quilt design! I started quilting with Thimbleberries in 2005 COL Quilt Club. I just love Thimbleberries fabrics and the quilt designs. I have decided to do this quilt with Apron Strings. I may need to supplement it with some “solids” from Laura’s Garden or Story Book Prints to complete the blocks. I do want to do a quilt with the Home Again green floral. I may make a second one with this same design. Thank you for the advice to date on batting. I will try the poly you suggested. Enjoy retirement and happy quilting! Wow, you really have some vintage Thimbleberries fabrics in your stash. Good thing is, so many work well together, even from years back. Even I don’t have any of those fabrics in my stash. Thanks for the nice comments. I’m putting together my fabrics for the quilt and discovered I had a big Thimbleberries fabric habit back in the day and bought a lot of it in 3 yard lengths/ But even better, the design of many collections work well together even though they are years apart. Because I like length of fabric borders, I’m going to have to hold off on my cutting but I think I have a nice project coming together. Between Quilt Club 2003,Circle of Love, Fancy Free, House and Garden, and Lazy Crazy Quilt, it is going to be a coordinated mish-mash of Lynette’s designs of years past. Going to block off time every day to stitch it up too. Since I own a longarm the quilting part is the least of my problems! 🙂 Thank you for giving us this great design. Three yard lengths are the best. 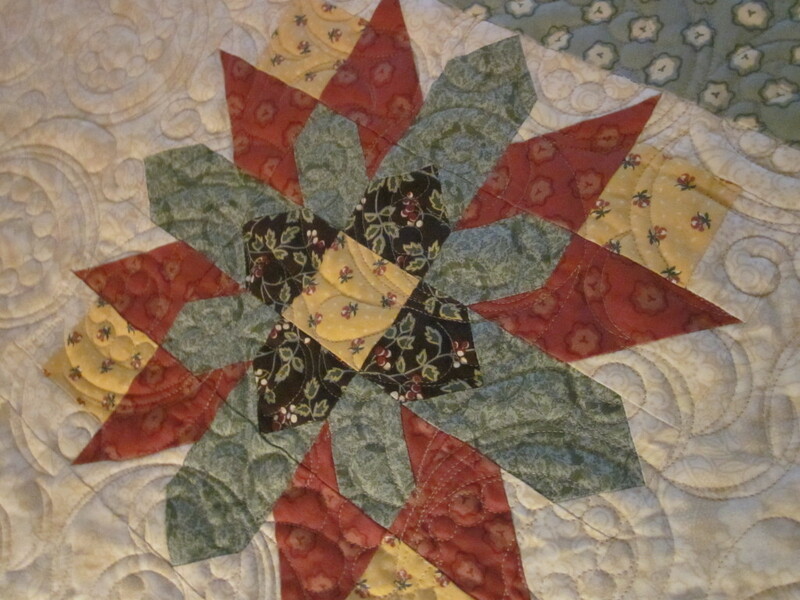 You can then have enough for borders as well as use a little in the middle of the quilt as well. It is the most common length I recommend people buy. It was always a goal when designing collections to have some of the colors repeat so that a Thimbleberries stash was always workable. I would love to see a picture of this quilt…top, okay…don’t wait until it is quilted to share with me. I have finally finished my Painted Daisy quilt top made with my vintage fabrics and some border adjustments. I will be quilting it soon and would be happy to send you a photo. Since I have a longarm I will be quilting it in the next few weeks. You can view the top here: https://pin.it/qlds3xqcg2g3um . I cannot print the instructions. The printer works fine with all other correspondence. I want to make this so badly. Any ideas what the glitch may be? Sorry you are having trouble…we will look into it. Your quilt is gorgeous and the quilting is absolutely beautiful. I’ve been hoarding some leftover yardage from a couple of Pansy Park quilts—I think I’ll use those to make this quilt. Thank you for sharing! 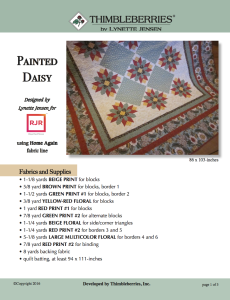 The Pansy Park fabric would certainly be a beautiful choice for the Painted Daisy quilt. Send me a picture when the top is completed. It will be fun to see that fabric collection used again. Thank you for section 1. I will start soon but still sorting through my Thimbleberries fabrics,plus I need to buy some more 🙂 Also getting things ready for my Hubby`s surprise 65th birthday dinner. Happy Stitching. It will be fun to see what you come up with. Send a picture when the top is done Have a good time at your party. You are welcome. I think you will love adding this quilt to your collection. I have my fabric and downloaded week one. Can’t wait!!! Thank you for doing this. I think it will be fun and I will FINALLY have a finished quilt! I have to tell you the photos do not do justice to the fabric. I was a little skeptical on the colors, but decided to purchase the exact fabric and when it arrived on Sat. I couldn’t believe my luck. I just love them!! I know, the pictures never do the fabric justice and digital pictures are even worse. Thanks for taking the leap of faith. If you were really concerned, I think you could always order a fat quarter which would really give you a good idea of the colors and prints and you know you could always use a fat quarter somewhere. I know you will love the quilt. Love your designs. Been quilting Thimbleberries since 2007. What loft and type of batting do you recommend? I have discovered a blend of 20/80 mid-loft works great though a low loft tends to require more quilting. combination of stitching and loft. If I do use use cotton, it is the blend. My family prefers quilts that are “floppy” as they call them rather than the stiff ones, so I have been staying away from all cotton. Another factor to consider, polyester batting is a bit more crease resistant, which you know always happens when quilts are folded and stored. That is another reason to have at least some poly in the mixture. I know q quilt purest would not agreed with any of this and would recommend natural fibers only. Hope this helps you with your decision. Thank you so very much! I will try the polydown batt. Enjoy quilting Thimbleberries patterns and fabric.